Kewpie Culture, charcoal and oil pastels on paper. To interpret my individual culture, this was a bit of a challenge. This was the final assignment for a drawing class last year. Although my family heritage was mentioned to me as a child, it was not a major influence. My upbringing did not include much tradition from a specific culture. The biggest thing that molded me was the chaotic feminine energy I was surrounded by–my mother and grandmother and this dysfunctional triangular relationship. So instead of making my final drawing about that, I chose to draw something that makes me happy, something I want to look at, something other people might enjoy as well. Kewpie dolls really turn me on. 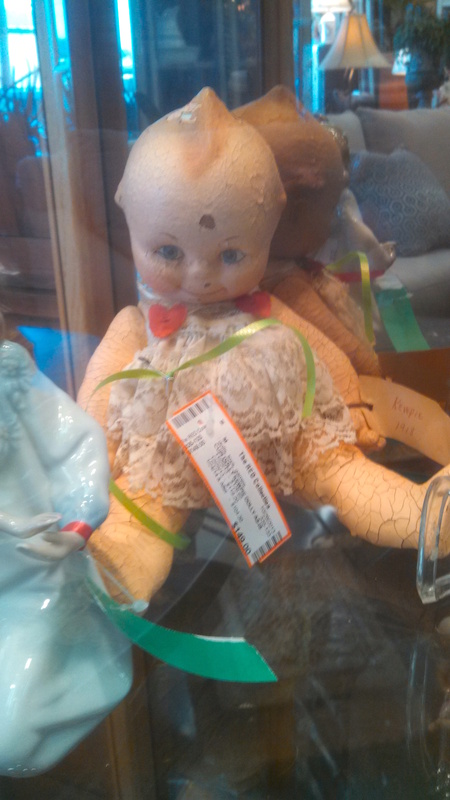 I discovered this sweet little doll in a consignment shop last year and immediately fell in love with her but the price was astounding, really…150 bucks! And her entire painted surface is completely chipping off. I visit her sometimes. Even though her price has been reduced, she still sits there, in a glass case, hidden behind some piece of hideous consignment furniture, hiding and waiting for me to come up with the cash–bail to spring her from the bondages of retail. 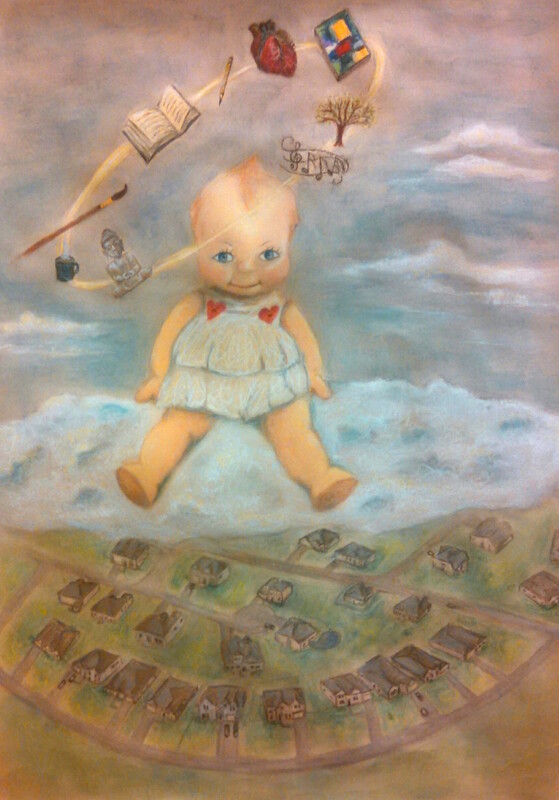 This drawing is of a kewpie doll on a fluffy, happy cloud floating over a cookie-cutter suburban neighborhood with various objects encircling her head. The drawing represents me transcending the mass-marketed, consumerist society that I previously thought I needed to conform to. 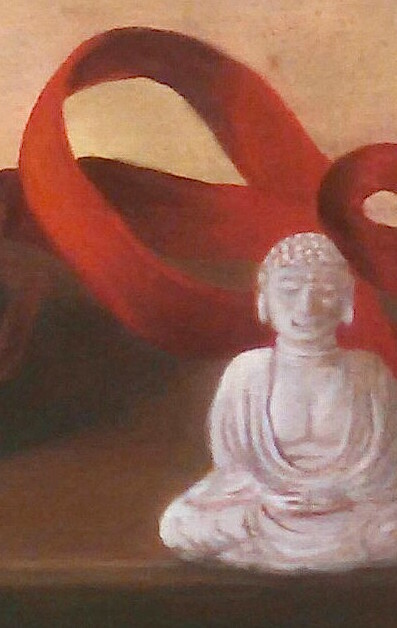 I now intentionally influence myself with cultural items that I choose–art/painting, drawing, literature, Buddhism, the heart, music, and nature. I surround myself with a combination of cultural elements that bring me joy. Buddhism, when revealed to me, made perfect sense. The messages have been packaged and repackaged in various ways over many years. My current favorite is Alan Watts. I know, he existed years ago, inspiring a turned-on hippy generation, but his relaxed attitude and simple down-to-earth delivery of ideas calms me, helps me make sense of things. I like to listen to Alan Watts recordings while I paint. On days that music with lyrics only adds to the swirl of ideas in my head, Watts helps me focus. 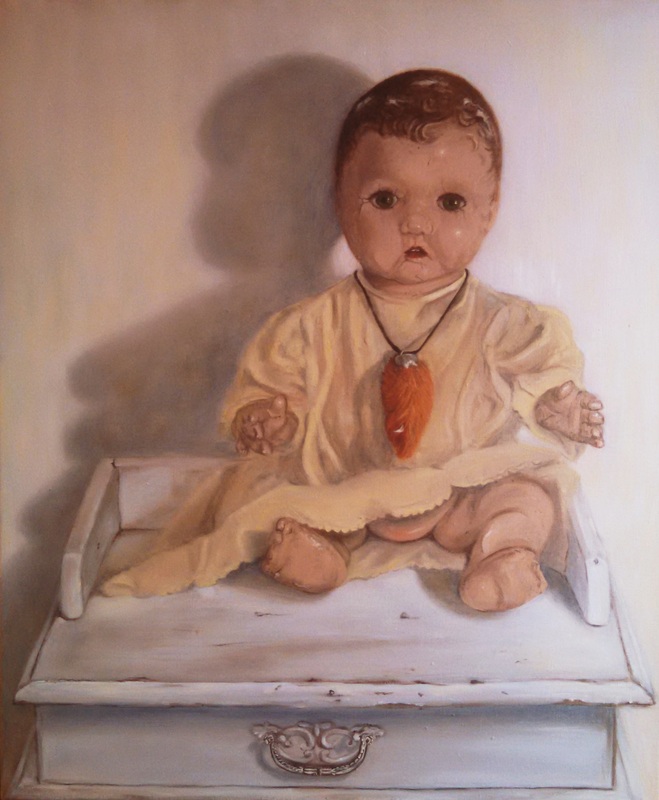 This entry was posted in art, buddhism, dolls, painting and tagged alan watts, culture, drawing, kewpie doll, oil painting, oil pastels, still life. I too listen to Alan Watts (Ram Das and Osho too…and, of course, his Holiness, the Dalai Lama) while doing artwork. AND I collect Kewpie dolls. Hope you manage to bail out your friend! Great to find another painter with an interest in “The Way”. Will follow along!